Original Editor - Stacey Jones and Ashley Gunzenhauser. Manipulation is a passive technique where the therapist applies a specifically directed manual impulse, or thrust, to a joint, at or near the end of the passive (or physiological) range of motion. This is often accompanied by an audible ‘crack’. 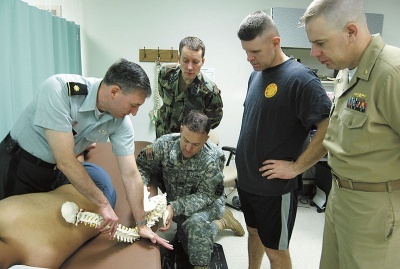 The common feature of spinal manipulation techniques is the fact that they achieve a pop or cracking sound within synovial joints. The cause of this audible release is open to some speculation but it is widely accepted to represent cavitation of a spinal facet joint. When there is a lower pressure than normal in the facet joint, gas bubbles are being formed in the joint. At the moment that the pressure rises, the bubble implodes, this is called cavitation. It is a intervention Physiotherpists have been employing since the beginning of physical therapy practice. However, physiotherapists providing spinal manipulations have come under the scrutiny of other professions even though manipulation is not exclusive to any one domain or profession. The challenge has been brought forth to many state legislators because some chiropractors have argued that manipulations are not within the scope of physiotherapy practice. The APTA has created a page that delineates the difference between physical therapy manipulation and chiropractic manipulation. They have also published a manipulation education manual. Spinal manipulations can relieve back pain by taking pressure off sensitive nerves or tissue, increase range of motion, restoring blood flow, reducing muscle tension, and, like more active exercise, promote the release of endorphins within the body to act as natural painkillers. Recent research has shown that the neurophysiological effects of a single session of spinal mobilization are mostly 5 minutes or less. An exception to these findings is hypoalgesia which may last up to 24 hours. The underlying pathological cause of low back pain (LBP) is only determined in about 15% of all cases. Because of this, there has been much confusion and debate about the best way to treat patients with LBP. There have been numerous studies done to determine the effectiveness of different treatment interventions for these patients. Evidence has been conflicting regarding the effectiveness of spinal manipulation as an intervention in this patient population. Spinal manipulative therapy is less effective than often assumed. The enthusiasm for this treatment as thé treatment for low back pain should be tempered. There is no evidence found that spinal manipulation is superior to other therapies such as back schools, physical therapy and exercises. But it is also not proven that these therapies are superior to spinal manipulation. So spinal manipulation is one of the several options for the treatment of patients with low back pain. The remark that all these findings are of modest effectiveness should be kept in mind. Next to it, manipulations are found more effective in the acute than in the chronic cases of low back pain. It has to be noticed that manual therapy is only indicated in the acute cases which have a varied course. On the other hand, it is proven that spinal manipulative therapy appears to be no better or worse than other existing therapies for patients with chronic low-back pain. The best way of using the manipulations is in combination with other therapeutic modalities. There is evidence from a high quality study, that spinal manipulative therapy combined with exercise is more effective than other procedures like spinal manipulation, exercise or physician consultation alone. Flynn et. al determined that patients that meet certain criteria were more likely to experience short-term improvements with spinal manipulation. A clinical prediction rule was developed in order to identify these patients with LBP who will most likely benefit from spinal manipulation. Spinal manipulation is a sub-group of the Treatment-Based Classification Approach for low back pain. The use of spinal manipulation as part of treatment for low back pain is recommended by several clinical practice guidelines, including the New Zealand Guidelines for Acute Low Back Pain, and the recently published NICE guidelines. Patient positioning can not be achieved because of pain or resistance. As you can notice, almost all complications are found with patients whom has been treated for a neck problem and not a thoracale or lumbar problem. A big question that remains unsolved is the incidence of the adverse effects. Fritz, Cleland, and Childs published an article in 2007 entitled "Subgrouping Patients With Low Back Pain: Evolution of a Classification Approach to Physical Therapy" which lays out the Treatment Based Classification Approach and explains the classification critia for the different intervention subgroups. ↑ 1.0 1.1 Rubinstein SM, van Middelkoop M, Assendelft WJJ, de Boer MR, van Tulder MW. Spinal manipulative therapy for chronic low-back pain(Review). The Cochrane Library 2011, Issue 2. ↑ 2.0 2.1 Gibbons P., Tehan P. Patient positioning and spinal locking for lumbar spine rotation manipulation. Manual Therapy. 2001;6;3;130±138. ↑ Assendelft W.J.J., Morton S.C., Yu E.I., Suttorp M.J., Shekelle P.G. Spinal manipulative therapy for low-back pain (Review). The Cochrane Library 2008, Issue 4. ↑ Heijmans W.F.G.J., Hendriks H.J.M., van der Esch M., Pool-Goudzwaard A., Scholten-Peeters G.G.M., van Tulder M.W., de Wijer A. , de Wijer R.A.B. KNGF-richtlijn Manuele Therapie bij Lage-rugpijn. V-13/2006. ↑ Rajadurai V, Murugan K. Spinal manipulative therapy for low back pain: A systematic review. Physical Therapy Reviews. 2009;14;4;260-271. ↑ 1. Fritz, Julie M. PT, PhD, ATC, Cleland, Joshua A. PT, PhD, OCS, FAAOMPT, and Childs, John D. PT, PhD, MBA, OCS, FAAOMPT, “Subgrouping Patients With Low Back Pain: Evolution of a Classification Approach to Physical Therapy,” Journal of Orthop Sports Physical Therapy 37, no. 6 (June 2007): 290-302. ↑ Flynn T, Fritz J, Whitman J, et al. A clinical prediction rule for classifying patients with low back pain who demonstrate short-term improvement with spinal manipulation. Spine. 2002;27(24):2835-2843. ↑ Fritz JM, Brennan GP, Leaman H. Does the evidence for spinal manipulation translate into better outcomes in routine clinical care for patients with occupational low back pain? A case-control study. Spine J. 2006;6(3):289-295.